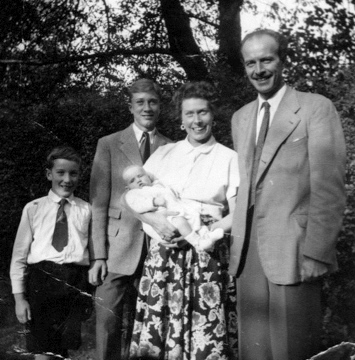 This is my 50th post and it’s dedicated to my mother Molly [Weakford] Ellis–whose cooking on a small budget in the late forties and fifties was resourceful and inventive. From her I learned that it was worth spending a little time in the kitchen–not least because I got to lick the bowls! 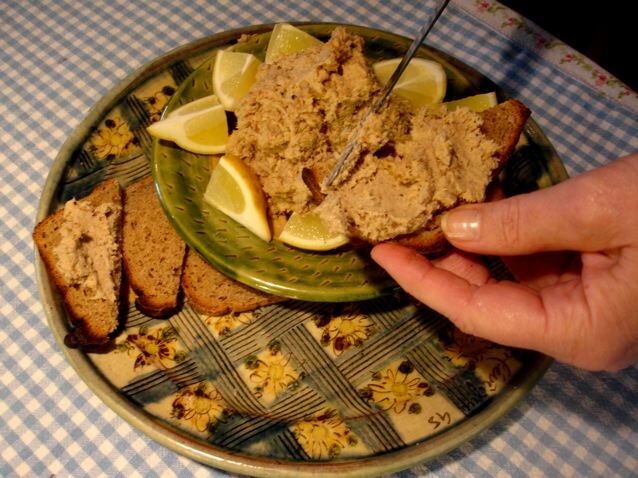 Her smoked mackerel paté has a fair amount of melted butter in it, but the oily mackerel is a healthy counter to it. I like it best served on toasted rye bread. 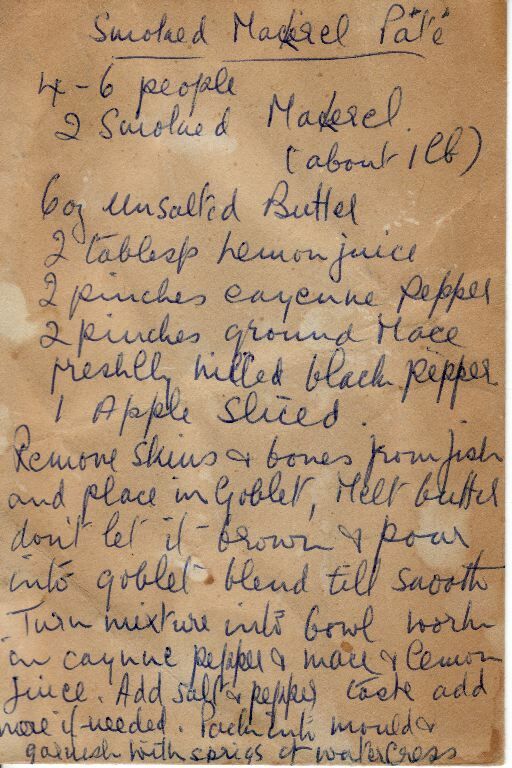 She wrote the recipe out for me on the back of an envelope and miraculously I still have it. Her flowing round hand is unmistakeable to me. Few of her written recipes survive, so I treasure this one. I made it this morning with the 8oz/250gms of mackerel bought last Saturday at the London Farmers’ market and reduced the other ingredient quantities accordingly…. The apple slices cut the richness of the paté. Watch out though–it is more-ish! Great posts, I love the pictures. Smoke fish is so delicious and few people make it. Glad to have another recipe. We’ll definitely try this one in Rhode Island this summer. By the way, why not come join us? 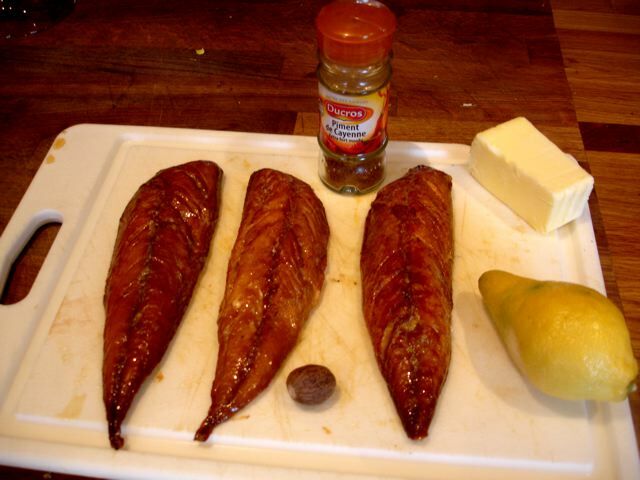 Believe it or not I bought two smoked mackerel filets today and actually have some apples – can’t wait to try it, Robin! Thank you for sharing the lovely photograph. Is there a generation we are more proud of? When I look at similar photographs of my own parents I wonder if we could ever do better than they! Our asparagus is not available yet so I tried this with long stem brocoli and it worked fine, but as you probably know, nothing can beat the taste of asparagus. Sorry, I was referring to the previous recipe with asparagus. Well there’s a thing. my mother was called Mollie as well – though different spelling. I like the name however you spell it! Can you elaborate on “place in goblet”? How do you blend it? In a food processor? Sorry I am away visiting and don’t have my own cookbooks (including a copy of yours) at hand. The “bowl” of the food processor is what I meant–not sure of the name–that into which one puts the things to be whizzed!! I’m loving these recipes Robin! I hope to pick up a copy of your book later this year when we are in Cornwall (hubby will be working there!) I live in about an hour from Ottawa in Canada and so far Chapters don’t have copies of it yet! I’ll be trying the mackerel pate though this weekend (if I can get hold of any!) Lovely to see you pop up as a chef no less!